This Deliverance and Spiritual Warfare Manual is a scriptural sound healing and deliverance seminar course manual, for those who want to learn how to pray over themselves after seminar or just want to own a copy. You will learn how to avoid traps and snares of the enemy and how to close doors to the demonic realm and demonic influences. Overcome demonic oppression, breaking demonic strongholds, generational curses, etc. Also, covers spiritual roots to disease and how to walk with the Lord’s covering or hedge of protection against diseases. The Garden of Eden was a hedge of protection. Attendees will gain valuable knowledge and understanding that is life-changing, as they are empowered to use the divinely-powerful weapons of warfare God has given all of us to find freedom and healing. Scriptures on the Flood Account comparison of scripture. After the Teaching what is next? Going the next level of training and becoming a minister with Touch of God International Ministries: Cost $375 manual, A More Excellent Way Book, certificate of completion, special graduation dinner, ordination (for those who are serious, etc.). Why don’t you buy your healing and deliverance manual today. 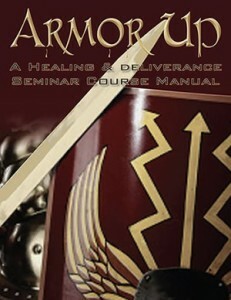 Own your own seminar course manual on healing and deliverance. You will understand yourself better as well as understand how Satan operates and demonic influences, demonic oppression, spirit of heaviness, understand spirit of infirmity and open doors to sickness and disease and demonic influence.